A Measured Spirit public service: Time-saving booze reviews with no room for preening, blather, and B.S! 1st gin from Md.-based maker. Think 1/2-hearted flavored vodka. Juniper-free; odd orange nose. Desecrates Wimsey name. Weak debut. Buy? Ha! So I was in the butcher shop, of all places, and came across a cocktail curiosity completely new to me: Carmencita’s Botanicals for Gin & Tonic. Essentially the product provides little bits of some of the botanicals often found in gin. You plop them into your Gin & Tonic to add additional flavor and scents and whatnot. 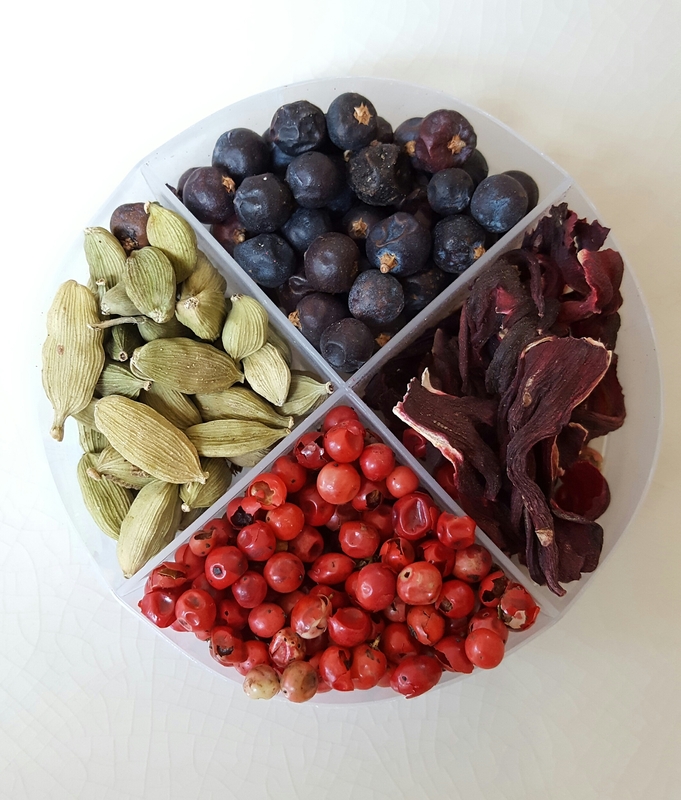 This kit ($6.95) contains pink peppercorns, juniper berries, cardamom pods, and hibiscus flowers. Gimmicky? Sure! But it’s a pretty nifty way to dress up an often samey standby. First, the visuals are great — vivid, colorful little things either stirred below the ice or resting on top, or both. As the minutes pass the hibiscus bleeds off some of its crimson hue, creating a floaty red smudge. The Carmencita: Just add gin and tonic. Flavors? Less so, but still usefully additive. The cardamom provides a surprisingly nice nose. [On my second experiment I gently broke the shell of the pods and the effect was enhanced. In time the pink peppercorns add some bite. The juniper? Seems redundant, and I’m not sure you need to turn up that flavor in a gin. I know what you’re thinking. [I always know what you’re thinking. How do I do it?] Can’t you just buy the spices and and save a lot of money? Why, yes, I can. And I will. I’ll thank Carmencita every time. As regular readers of A Measured Spirit know, I have launched a campaign to explore that great if slightly obscure American classic, the Gin Daisy. It’s not one drink, but several drinks, some with little in common beyond the name. Its origins are gauzy, its first recipe apparently lost. This has provided mixmasters almost 150 years of opportunity to improvise, riff, and commit various acts of mischief. So, for our second installment in this series, I decided to check out the most popular recipe I could find. For this I turned to Brother Google — the world’s always-on vast repository of knowledge, first refuge of rookie drinkmakers, and our most ubiquitous source of misinformation. When Google presents search results, the order is based on a complex secret algorithm. But its most important component is the number of other sites that link to a particular page. The thinking: If a lot of other people think something is valuable, it’s valuable.